LEEDS, UK, June 2, 2015 (ENS) – Billions in transport investment to end the decades-old economic gap between north and south is a top priority for the UK’s newly elected Conservative government, Transport Secretary Patrick McLoughlin pledged to northern and midland leaders Monday. Speaking at Leeds Civic Hall, McLoughlin said the May 7 election result was a massive vote of confidence for High Speed 2 (HS2), a planned high-speed rail line that will initially link the cities of London and Birmingham, followed by further extension to North West England and Yorkshire. Construction of the first phase of HS2 is set to begin in 2017 with an projected opening date of 2026, while completion of the entire network is expected in 2033. Over the objections of environmentalists, McLoughlin confirmed Monday that construction is on track to start in 2017. He said the Conservative government would invest £13 billion to transform transport infrastructure in the north over the next five years. McLoughlin pledged that the north will be empowered to shape its own future, working with the government through the independent body Transport for the North (TfN). He said that by the autumn, TfN will have a new chair to speak on behalf of the north on delivering improved train and bus services, rolling out smart ticketing, looking after passengers, reducing road congestion and speeding up links to ports and airports. 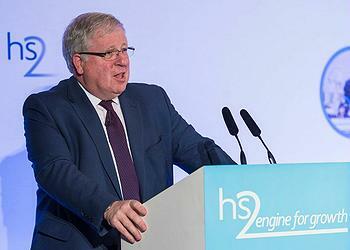 McLoughlin said the HS2 hybrid Bill committee will restart Parliamentary scrutiny of the bill for phase one – between London and Birmingham – shortly. The government will announce the way forward for phase two, from Birmingham to Leeds and to Manchester, later this year. Opposition to the high-speed railway comes from environmentalists, who warn it will harm wildlife and emit more greenhouse gases than existing rail lines. Founded in 2010, the HS2 Action Alliance (H2AA) has challenged “the flawed economic and environmental case for HS2” in the media, Parliament and the courts. 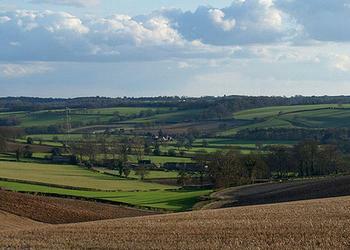 H2AA argues that “HS2 has a huge environmental price,” and the high-speed railway will not reduce carbon emissions. “HS2 Ltd’s own analysis shows low numbers of passengers shifting from higher-emitting modes of transport such as the car or plane to HS2,” the critics point out. “Official forecasts show HS2 will be dependent on millions of journeys transferring from existing rail services to high-speed trains, which emit significantly more carbon,” says H2AA on its website. But the rolling stock for HS2 has not yet been specified in any detail. Other critics speak for the Scottish National Party, outraged at the revelation late last month that there are no plans to extend the high-speed railway to Scotland. Other critics complain that there are no firm overall cost estimates for the H2 rail project, which they warn will waste of billions of pounds. The project is being developed by High Speed Two (HS2) Ltd, a company limited by guarantee and established by the UK government. The cost of HS2 is estimated by the Department for Transport to be £43 billion; although a study by the Institute of Economic Affairs suggested a much higher total cost of £80 billion.